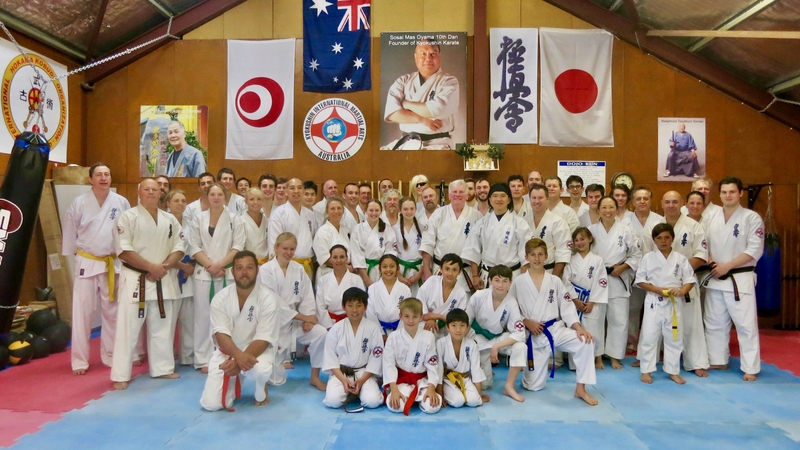 Shihan Ken Ogura (8th Dan) returned to Australia for his second seminar with Kyokushin International Martial Arts Australia on the week of 6-11 September 2017. Hanshi Howard Lipman & Shihan Ken Ogura. Shihan Ken first met KIMAA senior grades during the 2015 Japan Group Tour, during training with Sensei Tetsuhiro Hokama (10th Dan). Shihan Ken then came to Australia in 2016 to teach a KIMAA seminar at the invitation of Hanshi Howard Lipman. Shihan Ken met KIMAA seniors again during the 2017 Japan Group Tour in Okinawa. The seminar brought KIMAA students from all over the organisation. Guests from other Kyokushin dojos also attended, including Sensei David Craigie and his Young Dojo. Wednesday night’s training was held at Turramurra Dojo. 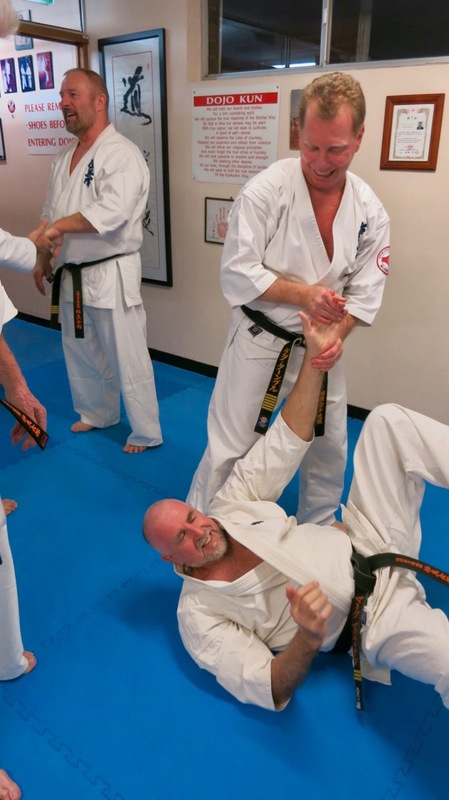 Shihan Ken took students through bunkai – the self-defence application of techniques and moves from kata. The kata focused on in particular were more of a junior level, to teach the foundation principles required for the weekend. Shihan Peter Olive dutifully resumed his duties from the previous year’s seminar, serving as the ‘crash test dummy’ that Shihan Ken would demonstrate the techniques, pressure points and take-downs on! On Thursday morning, a smaller, senior weapons class was held at Turramurra. 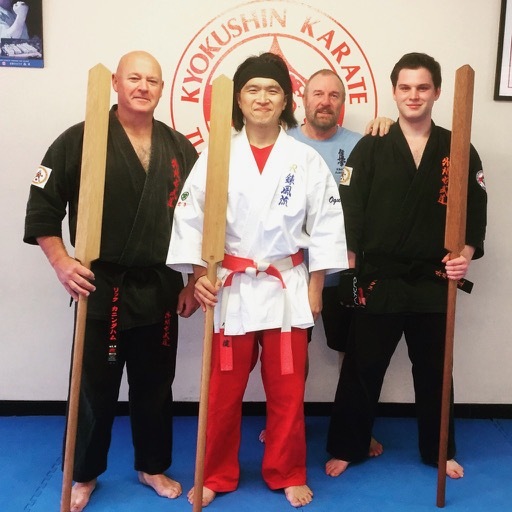 Shihan Ken took Shihan Rick Cunningham, Sensei Paul Finnerty and Sempai Alex Lloyd through Kobudo, with particular focus on the Eeku. Shihan Rick Cunningham, Shihan Ken Ogura, Sensei Paul Finnerty and Sempai Alex Lloyd, 7 September 2017. Shihan Doug Turnbull training with Sensei Mark McFadden. The class grew on Friday night, including Shihan Doug Turnbull (6th Dan) of Kyokushin International Karate Organisation. 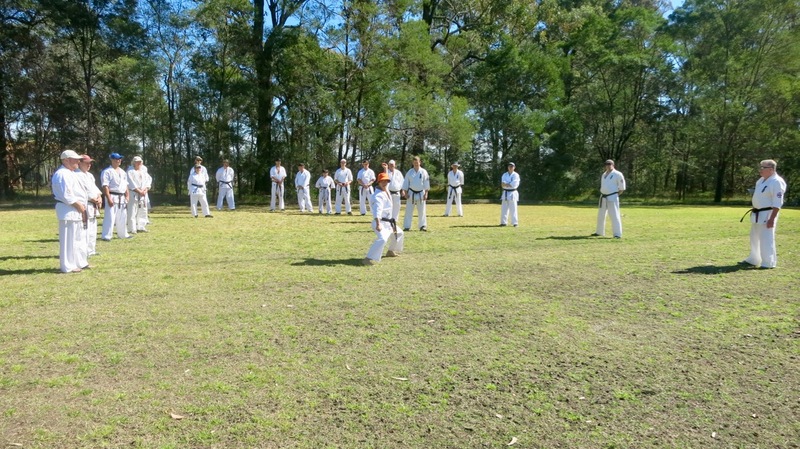 Shihan Doug has hosted many tournaments in which KIMAA students have competed, and has been part of Australian Kyokushin for decades. You can see Shihan Doug of KIKO with Hanshi John Taylor and Hanshi Howard Lipman in the committee photo in this article from our achieve series. Those making the trip to Sydney for the weekend from KIMAA included Sensei Mark McFadden and Lismore Dojo students; Sensei Jon Ellis and Ballina Dojo students; and Sempai Rob James of North Brisbane and Nundah dojos. Training continued along the same lines as Wednesday, but with some more advanced techniques and kata. Shihan Rick Cunningham, Shihan Doug Turnbull, Shihan Peter Olive, Shihan Ken Ogura & Hanshi Howard Lipman. After training, a group dinner was enjoyed at Noodle City in Gordon. The seminar continued at 9 am sharp on Saturday 9th at Annangrove Dojo. Hanshi Howard formally introduced Shihan Ken to all the black belts, then led the group through a basics session. The students were then broken up into smaller groups for rotating classes that lasted throughout the day. One group would be inside with Shihan Ken, while the others trained outside. Shihan Ken took the seniors through a new Eeku kata, and other groups through further bunkai and kata work. The others rotated between kata with Shihan Peter Olive, technique and focus with Sensei Idir Bahamid, the Sai with Sensei Mark Shelmerdine and the Bo staff with Sempai Alex Lloyd. The KIMAA NSW Far North Coast crew with Shihan Ken Ogura. At the end of a long but enjoyable day, Hanshi Howard Lipman announced a few Kyu grade promotions in Kobudo, and three black belt promotions in Kyokushin. Read more here about the promotions of Shihan Idir Bahamid, Sensei Mark McFadden and Sensei Rob James. Dinner for the out-of-Sydney guests and other seniors was held at Shihan Rick’s home. Thanks go to Shihan Rick Cunningham and his wife Kirsti for hosting Saturday’s dinner, and to Sensei Ian Holdaway for his lunch barbecuing efforts on both weekend days. Group photo of the Saturday seminar class. Sensei Don Cheong demonstrates Pinan Sono Go. Training began early the next morning back at Annangrove Dojo. The day began with a session focusing on basics, movement, speed and power with Shihan Idir Bahamid. After this, the seminar split into smaller groups, with Shihan Peter Olive, Sensei Paul Finnerty, Sensei James Sidwell and Sensei Mark McFadden taking instructional duties for those not working with Shihan Ken. The black belts had intense kata sessions on both Saturday and Sunday with Shihan Peter, including kata demonstrations by Sensei Don Cheong. Shihan Ken continued the same focus with the Kyu grades, while working with the black belts further on the Eeku kata, as well as Seipai and Saiha. Sensei Jon Ellis and Sensei Ben Ng took turns being the test dummies during the day. The day ended with Hanshi Howard thanking those from out of Sydney for travelling, Shihan Rick for all his help with the organising and accommodation, and most of all Shihan Ken for coming to Australia again to instruct KIMAA students. Hanshi Howard Lipman ended the day with some exciting news. After several days of intense training together, the students of KIMAA built a great rapport of those with Young Dojo, and Sensei David Craigie (3rd Dan) had a great time training with KIMAA’s black belts. 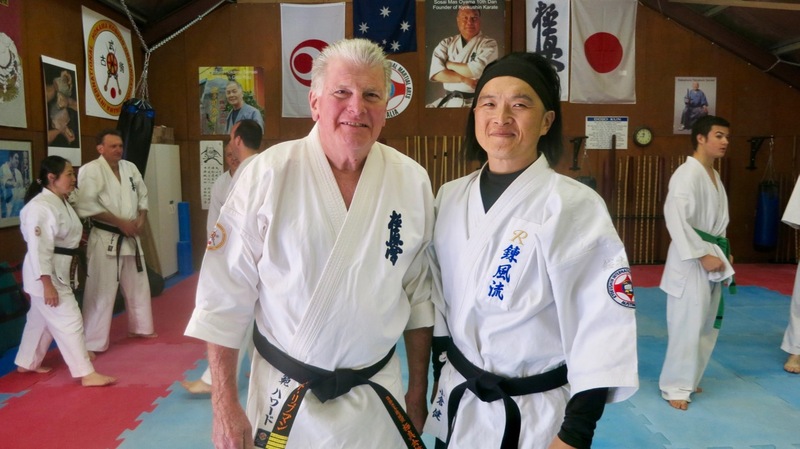 It was announced on Sunday September 10 that Sensei David Craigie and Young Dojo are now a part of Kyokushin International Martial Arts Australia, the seventh dojo of the organisation. 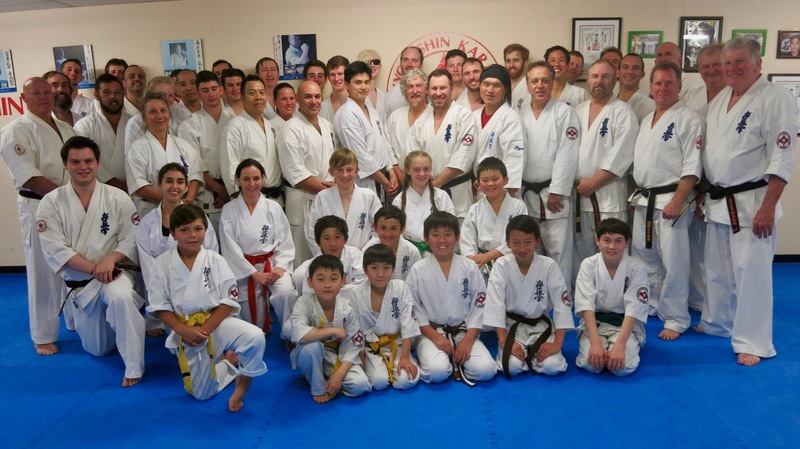 The final training session was back at Turramurra Dojo on the Monday night. This evening was spent consolidating the week’s worth of knowledge, with Sensei Ben acting as Shihan Ken’s demonstration partner for the evening. There was also a greater focus on pressure points and conditioning. KIMAA is delighted to have an ongoing relationship with Shihan Ken Ogura, such a widely regarded martial artist who is also an excellent teacher and friend of the organisation. We look forward to future training with Shihan Ken.